There has been a fish and chip shop in the same location for longer than most people can remember, it was formerly known as the Café de Laise, which developed a tremendous reputation for the quality of its fish and chips and the novelty of its small intimate restaurant, you were able to bring your own bottle of wine! In 1982 the shop was “modernized” and sadly the restaurant feature disappeared. The name was changed to “Ernie Entwhistles” and the reputation for good Fish & Chips continued and the shop has traded under the same Owners/management since. The old building was well past it’s sell by date and on the 14th of December 1999 was demolished, building work on the new shop started immediately. 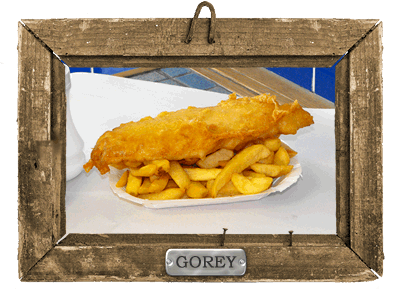 The shop re-opened on the 1st July 2000 and we have continued to keep our reputation for high quality fish and chips. On the 1st July 2012 we celebrated 30 years as Entwhistles, under the same ownership and management.